John Sutherland provides what is promised, sort of… It is a little history of literature, well, really mostly a little history of English literature. And by English literature, I mean from England, not from English speaking countries. Although he does start with the epic poems, The Iliad and The Odyssey – how could he ignore those – he rarely branches out after that. While Shakespeare, Jane Austen, the Bronte sisters, Dickens, Virginia Woolf, and other English authors and poets have their own chapters, and rightfully so, he dedicates only single chapter to American literature, with very small references to many great American authors. There are also mentions of American authors, and authors from other countries, sprinkled in other chapters where he discusses popular literature, e-books, publishing, and other general literary subjects. Having gotten my chief complaint out of the way, since I was hoping for a more well-rounded representation of literature, the book did provide a wonderful little history of chiefly English literature. The information is provided in an informal tone, with interesting insights into the cultural, personal, and historical influences. Intermingled with the chapters about specific authors are chapters about the history of the literary industry, providing readers with an opportunity to consider these impacts as well. Anyone who loves literature, and wants to gain greater insight into the history of English literature, will find this an interesting and easy read. 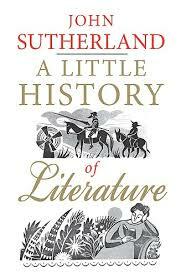 This entry was posted in Adult, Book Discussions, Non-Fiction and tagged english literature, history of literature, john sutherland, little history of literature. Bookmark the permalink. Hopping over from the Nonfiction Reading Challenge. This sounds like something I might like, especially this year when I’m focusing on books about England. Thanks! Seems it could’ve done with ‘British’ on the title. I think I’d be a bit disappointed, too. Glad to hear it’s informative otherwise. Well done on What’s In A Name – I love that you’ve got a book title with two subjects!